In this guide, we’ll look at some of the student progress data that is available on Atomi and how you can use it in your teaching. Let’s dive in! Where do I find my students' progress data? As students complete lessons on Atomi, you can see the completion summary next to each lesson. Clicking into this summary will expand into the full report view. 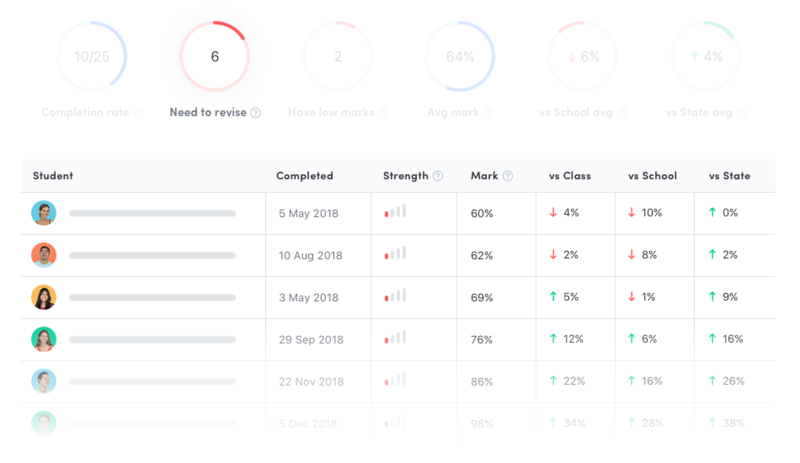 At the top of each progress report, you’ll see how many students have completed the content, how many need to revise the content, and how your class' marks compare to the rest of your school and the state where relevant. This will help you understand how your class is performing comparative to key benchmarks. To make it easy to see who’s doing well and who needs help, we break down this data for each of your students. Whenever a student takes a quiz on Atomi we calculate their marks by dividing the number of questions that they got right by the number of questions they answered, including any repeated questions. These marks are a decent indicator for how well the student understands the content at that point in time, however, as time goes by they'll start to forget. So here at Atomi, we use Artificial Intelligence to predict how each student's marks will change over time. Consequently, the more they practice and the better their marks become, the longer it will take for their strength to decay. How can I use this data to personalise my classroom? Understanding the difference between marks and strength can help you understand how your class is progressing with each topic and identify what kind of help each student might need. For example, students with low marks might be having trouble understanding the topic. You could run a masterclass or work with them individually to help address specific issues in their understanding. Students that need to revise might just need to cover the topic again in order to make sure it’s retained in their long term memory. Understanding the data can give you the ability to see these differences. Hopefully, this gets you excited about how you can use data to diagnose concerns and push your students to the next level. The possibilities are endless. To learn more about how other teachers are using data in their classrooms, reach out to our team.